Table salt, or sodium chloride (NaCl) is a widely available chemical. It also forms nice cubic crystals that are, unlike copper compounds, stable on dry air and not toxic. No surprise that almost every crystal growing book for kids recommends table salt as a good material to try. The instructions are innocuously easy: make a saturated solution, put a small seed crystal into it, and let it evaporate slowly. And voila! Single crystal of NaCl, about 1cm in size. More photos in the gallery. But this almost never works. With some patience, you can make good transparent cubes... few millimeters in size. Often, you won't get even this. This method works perfectly with copper sulfate, alum, many other salts, but not with NaCl. I guess, those who write all these books are just citing other's words and never tried to follow their own instructions. There are several factors that are causing the problem. Firstly, NaCl is prone to forming Hopper faces. With some substances like bismuth, the sometimes leads to a beautiful results, but not with table salt. You'll get dendrites, white crystalline crust, hollow flat rectangles - anything but not the transparent cubes, drawn in the books. NaCl also crystallizes too readily, using every smallest crack or dust particle as a seed. 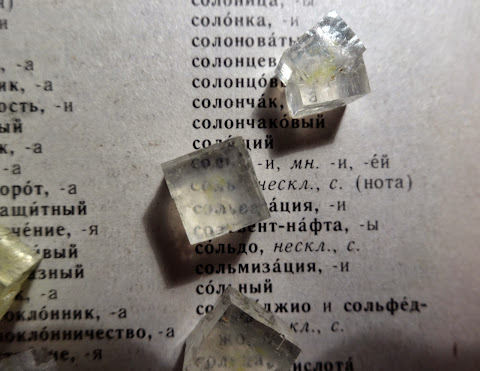 Table salt crystals, grown in 7 months. The biggest one is about 2cm in size. Yellow substance is inclusions of the iron (III) chloride. So, without some trick you'll never get big and (relatively) transparent crystals like ones at the photo above. I'd like to share a trick I have found by an accident. Not sure that it is the best method for growing NaCl crystals at home, but it worked for me, at least. The trick was to use not the pure NaCl solution (as it is usually recommended), but a mixed solution of salt and iron (III) chloride FeCl3. The latter is a brown crystalline solid, highly soluble in water. It is used by amateurs in the printed circuit board production, and can be bought in the most shops for electronic hobbyists. Growing NaCl crystals from the solution with FeCl3. 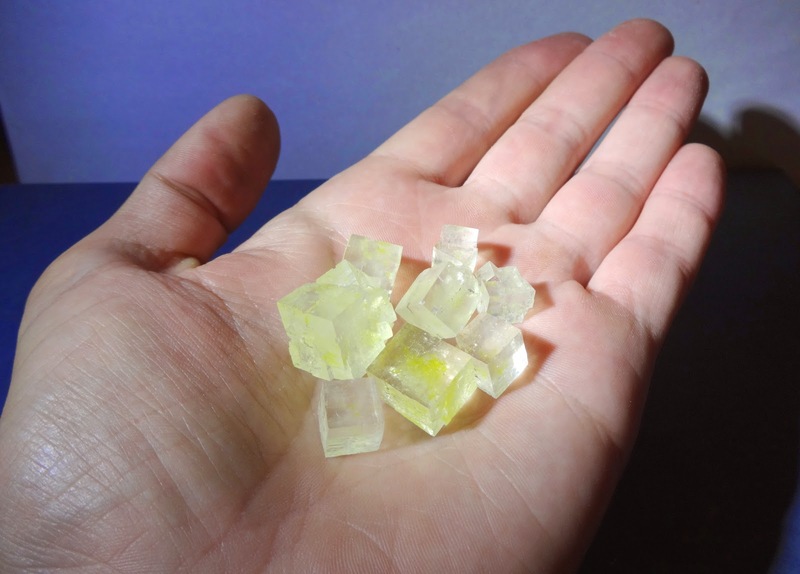 By some mysterious reason, presence of FeCl3 changes the way salt crystals grow: they are growing bigger and more transparent. 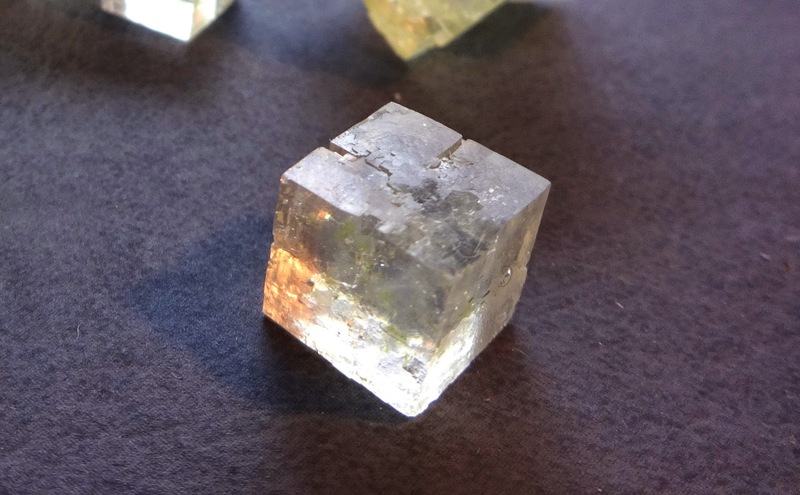 Iron chloride itself is not going into the crystal, though occasionally, small portions of the ferrous solution are getting included in the transparent crystals, creating yellow spots inside. The crystals are relatively transparent and clear. I used the following procedure, you could improve it according to your taste. Prepare solution: dissolve some FeCl3 in the warm water. Solution must have intense yellow color. Then add salt in excess, and let it dissolve for several hours. If all salt dissolved, add more. Prepare a seed crystal: take thin fishing line or some filament, put it in a drop of solution and let it dry. Some very small crystals will stick to the filament. Remove all of them except 1 or 2. (Instead of growing crystal on a thread, it can also be grown on the bottom of the container). Fill a clean glass or plastic container with solution, and put the seed into it. Cover the solution (not tightly), to slow down evaporation and avoid dust. Wait patiently. If salt crust is forming at the edge, don't let it grow too large, move your crystals to a new clean container. Also, crust can be dissolved by a drop or two of pure water. During the growth, concentration of FeCl3 grows gradually, so add small amounts of pure salt solution when appropriate. Crystal growth is not fast. In my case, growing centimeter-size crystals required about 6 months. 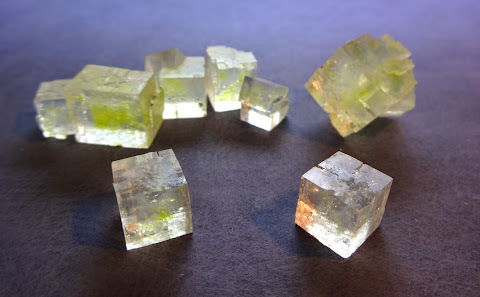 Salt crystals are hard and very stable on air, because they don't contain crystalline water (unlike the easier to grow copper(II) sulfate, which gradually loses transparency if exposed to the air). Their basic form is cube, though crystals growing on the bottom of a jar would be shorter along the vertical axis. Also, growing in the solution with FeCl3 is making their faces somewhat uneven, as if they are made of lots of smaller cubes. Iron(III) chloride is not a toxic compound, though it can irritate skin on contact. Don't taste it though, technical grade chloride may contain significant amount of more dangerous impurities. It is also strong corrosive agent that can easily etch copper, iron and many other metals. Don't put it into a metallic container, use glass or plastic. Iron(III) chloride also makes permanent stains on clothes and tables, so handle it carefully. Wash the crystals with pure saturated salt solution and wipe them well, and they will be entirely safe to handle. I've discovered the effect of iron chloride accidentally, forgetting a bottle with solution opened for several weeks. When I found it again, it contained some transparent salt crystals, much bigger and cleaner than I would expect. Possibly, there are other compounds that work as growth stabilizers, what are them? My intuition suggests that other metal chlorides and glycerol are good candidates.